Energy, commitment, and calls for change remained high this past weekend during the third annual Women’s March San Diego. Leading off the march in Oceanside were songs including “We are family” by Sister Sledge and Aretha Franklin’s “Respect” which got crowds going before the march started. Representatives from various Native American tribes in California provided an opening prayer and sang songs, including one from the Cheyenne Nation often sung in ceremonies honoring women. “We are sacred life givers, nobody comes into this world without coming through a woman,” said Wendy I. Schlater, with the La Jolla Band of Luiseño Indians, who advocates to end violence against native women, and who was among the first speakers at the Women’s March in Oceanside. “Male privilege and patriarchy are part of the problem so it needs to be part of the solution,” Schlater added after acknowledging the number of men who were at the march. Schlater also talked about the importance to pushing to renew the Violence Against Women Act, the federal law which expired as a result of the recent government shutdown. Oceanside City Councilmember Esther Sanchez also spoke at the march, which showcased the voices of newly elected officials including Congressman Mike Levin, Vista City Council Member Corinna Contreras, Carlsbad City Councilmember Priya Bhat Patel, Escondido City Council Member Consuelo Martinez, Martha Alvarado with the Vista School Board, and Laura Montes with the Immigrant Justice League among other speakers at the march. A diverse group of people and ages were in the crowd, but younger generations had a strong presence. Ariana Gonzales, Stephanie Solorio, and Andrea Villanueva were among them. “With our new president, Donald Trump, he brings a lot of chaos to our government. There’s many things he’s said I don’t agree with, and there’s many people he’s offended. Very racial issues he’s created. I feel when all women stand up against him we can achieve a better goal,” said Stephanie Solorio from Vista on why she went to the march. 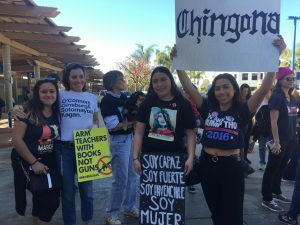 The Women’s March, now in its third year, included several events throughout the county, including the march in the north county in downtown Oceanside. Women’s rights, the rights of immigrants and refugees, abuse by law enforcement, LGBTQ rights, violence against women, sexual assault and calls for unity were among the issues highlighted throughout the marches in the region. “I’m a college student. I’m growing up and (the president) is pretty much determining the future with what he does, so I feel as young people we need to have our voices heard. And Planned Parenthood does such amazing things for everyone. I think organizations like that can’t be silenced, so I think being here, lets our voice be heard for Planned Parenthood, for immigrants who are humans and don’t need to be in cages,” said 19-year-old Ariana Gonzales from Vista why she attended and what issues were important to her. About 20,000 people are said to have turned out for the march in downtown San Diego. The San Diego marches were just some of many held in cities across the U.S. last weekend. The downtown march also included music and speeches. Speakers of the downtown march included emcee Nora Vargas who serves on the governing board for Southwestern Community College and is running for County Supervisor, San Diego City Councilwoman President Pro Tem Barbara Bry who is running for Mayor of San Diego, California State Assemblymember Todd Gloria who is also running for Mayor of San Diego, community leader and co-founder of the San Diego Compassion Project Tasha Williamson who is also running for Mayor of San Diego, San Diego City Attorney Mara Elliott, California State Assemblywoman Lorena Gonzalez, and her husband, San Diego County Supervisor Nathan Fletcher. The first march was held in January 2017, in the first month President Trump took office. Last year’s march encouraged attendees to get out and vote in the November 2018 elections, which led to gains for women, and people of color in San Diego and across the country. “This change is not over,” Contreras added. “This is just the beginning, 2020 is coming, we’re getting on that train and we’re changing the direction of this nation because it is not working for us,” she also said.